This is possibly the most important training you need to do. It is a magical exercise that if done properly, will transport you without you knowing, into the subconscious creative state that is so nourishing to one's soul. Using a sharper pencil, preferably 3B or 4B and the paper before you, have the model strike a pose they can hold for 10 minutes or so. Sleeping family members, pets, your left hand or your foot, or even household items are all good substitutes. Remember that once you start, you will not look at your drawing at all. This is really a "blind contour drawing". Look at the model and imagine your pencil is your finger and that you are running your finger over the outer edge of the part of the model you are drawing. Note that in places, the surface you are tracing with your finger/pencil recedes away and another starts near it. Where the surface moves away from you, press firmer with your pencil, as if to follow the edge away. Where it comes towards you, press more lightly. The main objective is to follow the contour. Forget about proportions and accuracy. Just trace the contour while constantly imagining your finger moving slowly along it. At first this is difficult. The concentration is intense but as promised, it will transport you. Again, you're not trying to make pretty pictures. These are exercises. Until you have done many dozens over a period of time, you cannot begin to realize that these are the key to better drawing and painting. As a side exercise, do a tracing of a master drawing. Just the main lines not the shading. 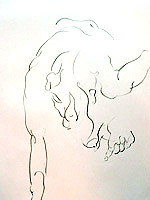 Turn it upside down and do a contour drawing – a copy of the upside down drawing. You will be surprised at the accuracy of your exercise. It will reveal to you just how much we draw, not what we see, but what we think we see.